Belarus blasts the U.S. government's invasions of privacy in a new report. Belarus Is Blasting the U.S. Government’s Invasions of Privacy. Like It’s One To Talk. 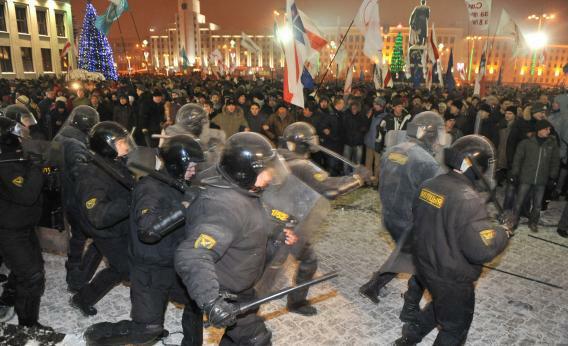 Protesters clashing with riot police during an opposition rally in Minsk, Belarus, on Dec. 20, 2010. Calling out hypocrisy by resorting to hypocrisy is not usually a tactic that will win you an argument. But no one seems to have told Belarus. The report blasts the Obama administration’s recent renewal of the Foreign Intelligence and Surveillance Act, criticizing “the right of the President to order warrantless surveillance, and demand from companies and organizations to disclose information on citizens’ finances, contacts, public activity.” It also points the finger at “the use of GPS devices to monitor targeted citizens without a court permission” as an example of privacy violations. More broadly, it condemns how police treated Occupy protesters—illustrated with a photo of a bloody-faced activist at a demonstration in Chicago. The stated aim of the report, which was produced by Belarus’s foreign ministry, is to draw attention to double standards in developed democracies. In addition to the United States, it features Canada, the United Kingdom, France, and Germany, as well as 20 other countries. But it is also a clear attempt to paint Belarus in a more positive light and to justify its own abuses. It might be convenient politics to attack other countries for “unlawful interference with privacy,” and some of the criticisms leveled in the report are valid. But ultimately it feels a bit like getting a lecture on the Geneva Conventions from a convicted war criminal. If Belarus actually wants to be taken seriously, it could start by getting its own house in order.